- 3 operation modes:Hammering, hammering with rotation, rotation. - Net weight 3.5 kg. * Tool does not come with bit. Outstanding performance with 36V Lithium-ion battery. - Elastomer to protect from external shock. - LED job light with afterglow function. - Net weight 4.5 kg. Rotary Hammer : HR1830 18mm (11/16") Adapted for SDS-PLUS bits. - Extra-low vibration under no load running. - Rotation reversing system using brush holder unit. Rotary Hammer : HR2230 22mm (7/8") Adapted for SDS-PLUS bits. - 2 operation modes : hammering with rotation and rotation only. - One-touch sliding chuck enables easy bit change. - Easy-to-operate large trigger switch and lock-on button. Rotary Hammer : HR2460F 24mm (15/16") Adapted for SDS-PLUS bits. - Features a built-in LED job light. Combination Hammer : HR2470 24mm (15/16") Adapted for SDS-PLUS bits. - 3 operation modes - hammering, hammering with rotation, rotation. Combination Hammer : HR2470F 24mm (15/16") Adapted for SDS-PLUS bits. Combination Hammer : HR2470FT 24mm (15/16") Adapted for SDS-PLUS bits. Combination Hammer : HR2475 24mm (15/16") Adapted for SDS-PLUS bits. Combination Hammer : HR2810 28mm (1-1/8") Adapted for SDS-PLUS bits. - Highest-in-class efficiency in both drilling and chipping. - Compact L-shaped motor housing. - One-touch sliding chuck enables easy bit changes. Combination Hammer : HR2810T 28mm (1-1/8") Adapted for SDS-PLUS bits. Combination Hammer : HR2811F 28mm (1-1/8") Adapted for SDS-PLUS bits. - Features a built-in LED Job Light. Vibration absorbing grip. Combination Hammer : HR2811FT 28mm (1-1/8") Adapted for SDS-PLUS bits. 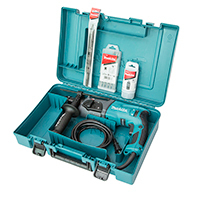 Combination Hammer : HR3200C 32mm (1-1/4") Adapted for SDS-PLUS bits. Combination Hammer : HR3210C 32mm (1-1/4") Adapted for SDS-PLUS bits. 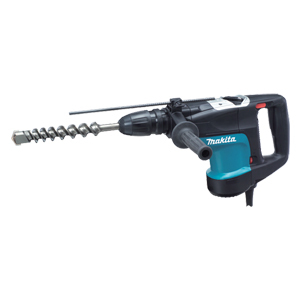 Forcible drilling and chipping with low vibration. - No hammering while idling. - Auto cut-out Carbon Brush. 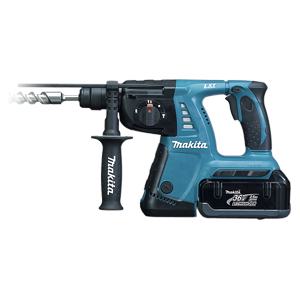 - Achieves most efficient hammer with satisfying powerful performance. low vibration model (with Vibration absorbing grip). you extreme comfort during job. - Recommendable for managing exposure of vibration to the body. - Same power as HR4001C and HR4010C. and compact design (Hex Shank type). - Aluminum housing provides high quality and toughness. - Electronic variable speed control dial enables to select speed to job.